Dublin – 10th April 2019 – Solgari, the provider of All-Channel Cloud Communication Services, announces the appointment of Marcel McCann to the board of directors as global growth accelerates with the launch of the Dynamics 365 All-Channel Solution in partnership with Microsoft. 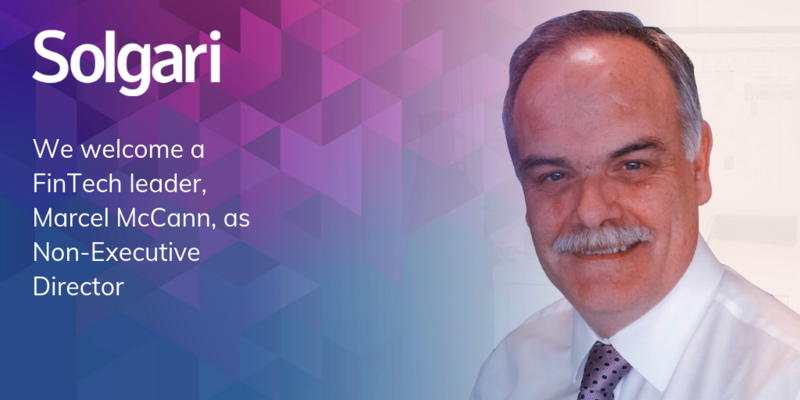 Marcel joins Solgari with a wealth of experience leading the management of operations and technology at leading financial service firms, including COO at AIB, the largest Irish bank by assets, and IBRC. Marcel is currently Director of Optimus Cards Ireland and COO of Optimus Card Group and takes up the board position at Solgari as the company enters a high growth stage in a number of international markets. Solgari is the enterprise solution for organisations with demanding, multi-channel communications needs, who are looking to increase efficiency and effectiveness, meet all related compliance requirements, and to delight customers. The solution is used in over 40 countries to-date, serving customers across financial services, FinTech, retail, eCommerce and many more, all on a per user per month SaaS model. As a global Microsoft ISV, our Dynamics 365 All-Channel Solution is being deployed with multiple Dynamics 365 partners and customers in UK, Germany, US, Canada, Dubai, India, Hong Kong, Singapore and Australia. Solgari provides all-channel cloud business communications to FinTech, Financial Services, eCommerce, Retail, Logistics, Recruitment & Government customers in 40 countries to date. Solgari’s cloud software service provides all business communication channels – voice, video, chat & SMS – while automatically addressing GDPR, PCI DSS & MiFID II regulations through compliant recording & archiving of all communications. We are also the first all-channel communications solution for Dynamics 365, enabling fast, smart, compliant connections and collaborations all without leaving your CRM window.